D.I.D Racing Chains are premium chains known for superior quality and reliability. Using race proven technology, D.I.D chains are the top choice for race champions and motorcycle manufacturers worldwide. Wherever you go, go with D.I.D. Uncertainty. 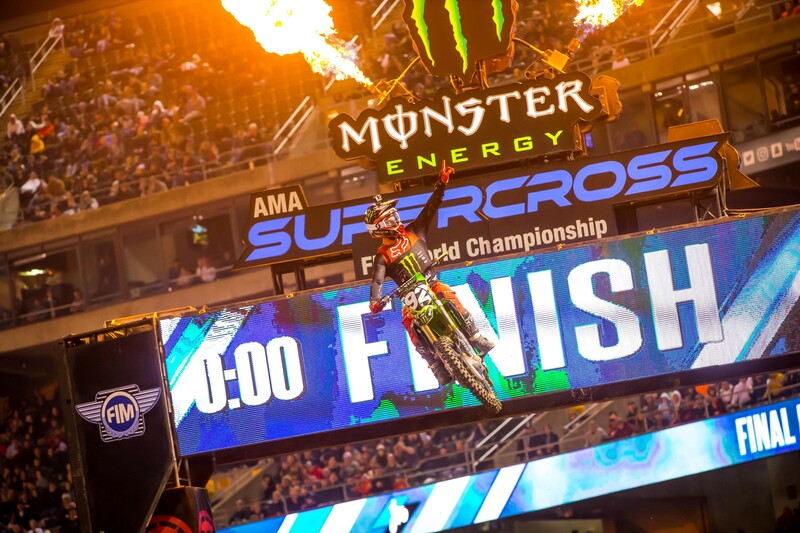 That’s about all we could be certain of as Monster Energy Supercross came into Round Four in Oakland, California. 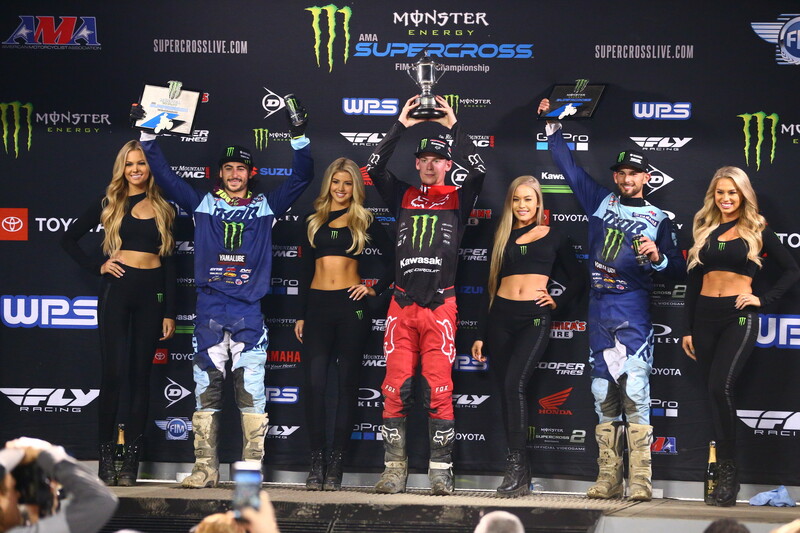 There’d been three different winners in as many races, and two of those winners, Blake Baggett and Cooper Webb, were first time winners in the 450SX Class. Further puzzling was the fact that heavy hitters like Eli Tomac, Ken Roczen, and Marvin Musquin hadn’t won yet. Would the strange times continue in Oakland? Let’s jump into this week’s Saturday Night Live to find out. The trend of new winners did indeed come to an end this week when Cooper Webb straight up dominated the 450SX main event. The Red Bull KTM rider took the holeshot and led wire-to-wire to secure his second consecutive career victory. He had some pressure from Marvin Musquin at the end, but he was able to take care of business. The win also hands him the points lead, which is something nobody could have predicted before the start of the season, including Webb himself. Webb would later say that gaining the points lead isn't a pressure booster. If you’re wondering who was faster than Webb tonight, look no further than Webb’s teammate, Musquin. After crashing while running second he seemed to come up with an extended burst of speed and went on a rampage, regaining the spots he’d lost to Tomac and Roczen and finding himself right on Webb’s rear wheel on the final lap. If he’d had one more lap, he may have been able to take the win. Rounding out the all-KTM podium was Blake Baggett, who now sits seventh in points thanks to inconsistent results. The trend of Tomac and Roczen not winning races continued tonight, as both riders again found themselves on the outside of the winner’s circle looking in. 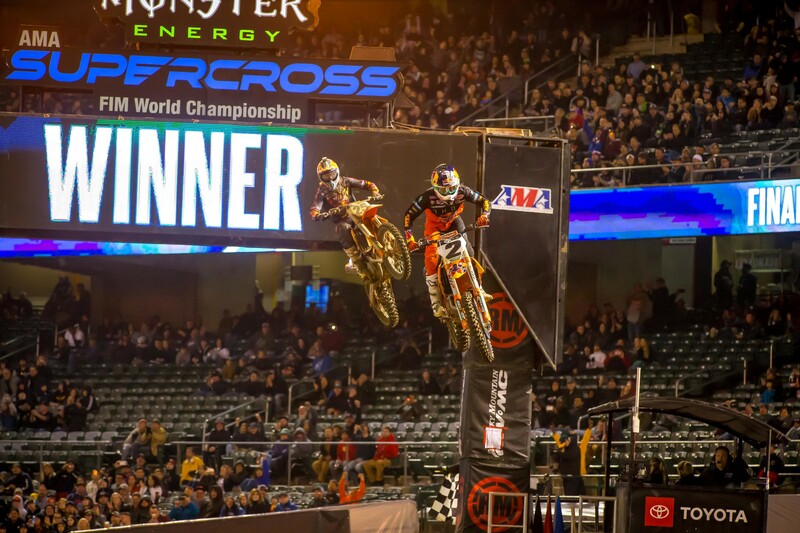 Neither one of them even ended up on the podium tonight, although Tomac, after a bad start, did run as high as third. Roczen was even second for a while but Baggett and Musquin were just too strong in the second half of the race. It didn’t help that Tomac missed a pair of triples, either. Yet despite both superstars’ failure to stand on top of the podium in 2019, they’re both doing just fine in the points. Roczen, who had the red plate coming into Oakland, now sits two points back of Webb, and Tomac sits just three points back. It seems weird to say, but Tomac, despite not winning yet, is having, by far, the best 450SX season of his career right now. Joey Savatgy looked great early in this race, and even held second briefly before crashing in the sand section and notching a DNF. Aaron Plessinger looked pretty good early too, running as high as sixth before crashing right before the sand section. His bike was in a tough spot on the track, and he was forced to wait for traffic to clear before he could retrieve it. It cost him loads of time and when the checkers flew he was in nineteenth. Not the greatest night for Justin Barcia, who ended up with seventh. If you’re a Barcia fan don’t get too bummed though, he had a couple things working against him. The first was his start-he was ninth after one lap. The second was his tailbone. He bruised it heavily last week in Anaheim and was likely riding in a lot of pain out there. In 250 action it was all Adam Cianciarulo. 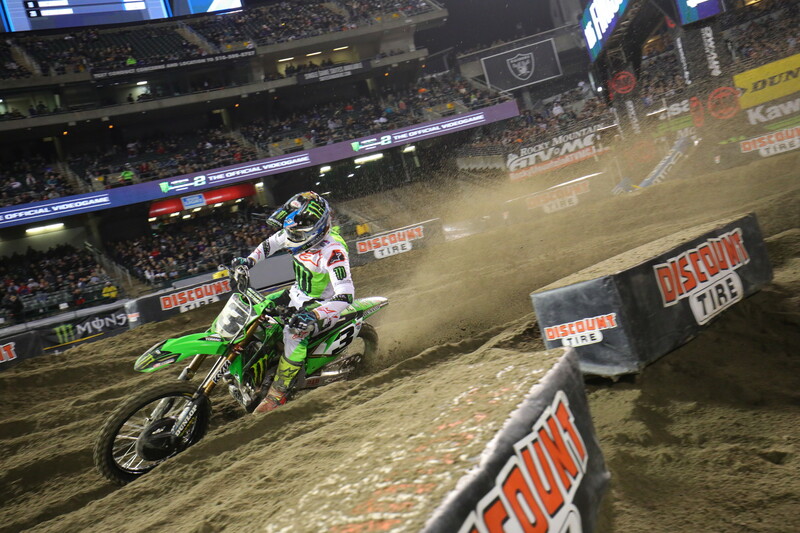 Like Webb, Cianciarulo took the lead immediately and led every single lap of the main event to record his second win of the season. Interestingly enough, Cianciarulo would later admit he had a pretty tough time during practice. Despite having more wins than anyone else in the class, Cianciarulo doesn’t have the points lead, thanks to off-nights at rounds one and three. Dylan Ferrandis had another good night, and put in a charge in the closing stages that saw him close up on Cianciarulo. With one lap to go Ferrandis was all over Cianciarulo, but a small mistake from Ferrandis gave Cianciarulo all the breathing room he needed to get the win. Tonight’s second place marks Ferrandis’ third runner-up finish in 2019, and he now sits fourth in points, just one point back of Shane McElrath in third, and five points back of 250SX series leader Colt Nichols. 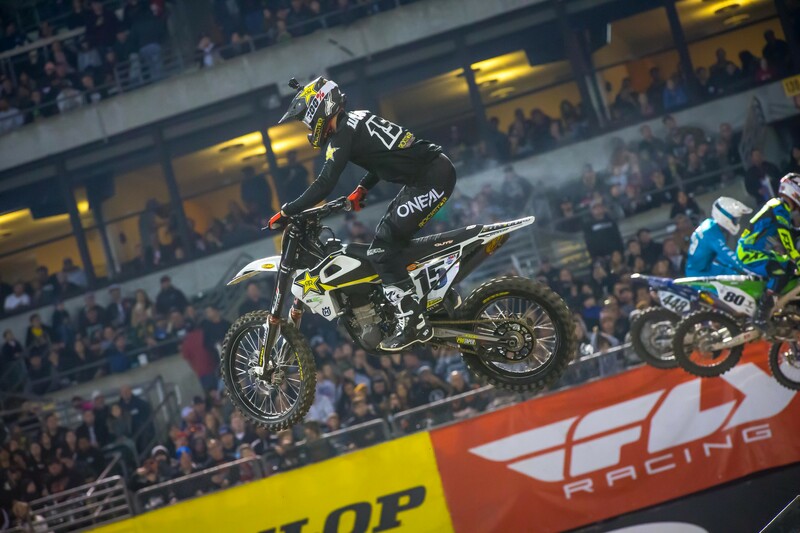 Speaking of Nichols, the Monster Energy/Yamalube/Star Racing/Yamaha rider took third, retained the points lead, and has yet to finish off the box in 2019. It’s the best season of his career to date so far, but afterward he didn’t seem thrilled. Jacob Hayes has been fast at times this season, but his results haven’t always reflected his speed. Well, tonight they did, as the Cycle Trader/Rock River/Yamaha rider notched fifth, which is the best result he’s had since making the jump from arenacross at the beginning of this year. Bummer of a day for Jimmy Decotis, who looked great in qualifying and won his heat race. He looked better than he’d looked all season, which is interesting because he didn’t ride all week on account of being sick. Unfortunately he wasn’t able to showcase that speed tonight in the main. A crash on the second lap knocked him back to last place and he eventually crossed the line in fifteenth. Red Bull KTM Factory Racing’s Cooper Webb collected his second consecutive 450SX victory in Oakland and took over the points lead heading into round five. Full race replay and results from the 2019 Riola Sardo Motocross, the opening round of the 2019 Internazionali d'Italia Motocross preseason championship.